Any and all mushrooms respond to this treatment, even the most generic closed-capped supermarket buttons. 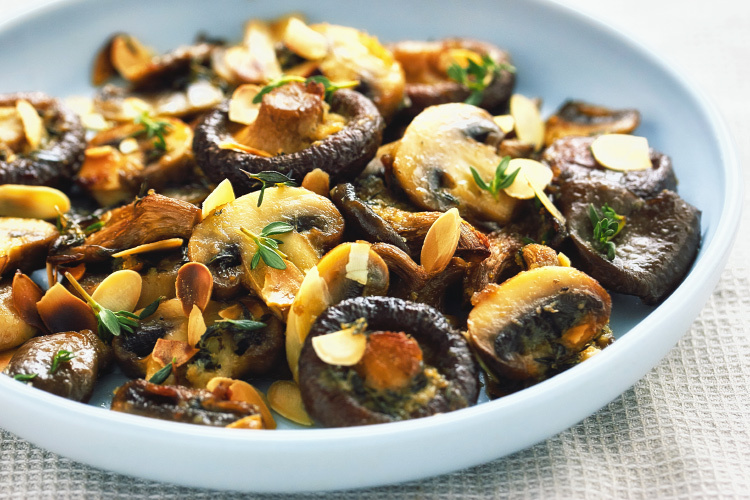 The garlic and mushroom’s favourite herb, thyme, seem to bring out the savoury earthiness of mushrooms themselves, as if you had foraged them fresh from the forest floor rather than tipped them out of a paper bag. They are a glorious accompaniment to many dishes, perhaps none more so than an otherwise plainly roasted chicken. With a steak, hot from the grill pan or barbecue, they are sublime. They’re also fantastic tossed through long, wide pasta like pappardelle or fettucine. It helps to start them off packed, quite tightly, into the smallest baking dish you can manage to cram them into before slathering on the garlicky butter. They will shrink as they cook down, of course, but not so much as they would if you roasted them spaced out on a baking tray, and it keeps some of their meaty texture intact. For reasons of speed, I recommend quite a hot oven below, but it’s not absolutely essential. If you’re cooking them in the same oven as a chicken, which would be a little more moderate, just cook them for a few minutes longer before tossing in the almonds, and leave them in the oven until the almonds have toasted up nicely. Set your oven to 220°C (425°F). Put the butter in a small bowl and grate (or crush) in the garlic. Strip the leaves off a few sprigs of thyme until you have about a teaspoonful and add to the butter. Stir together and set aside. Cut your mushrooms into chunks or thick strips as you like. Cut small mushrooms, like buttons, in half. Pack the pieces into a baking dish. They should be roughly sitting in a single layer. Spread the garlic butter over top with a small spatula or the back of a spoon. Bake the mushrooms for 15 minutes. Remove from the oven, sprinkle in the flaked almonds and season with some salt and black pepper. Toss together gently and return to the oven for another 10 minutes or until the almond flakes have toasted up nicely. Scatter over a few more fresh thyme leaves and serve.